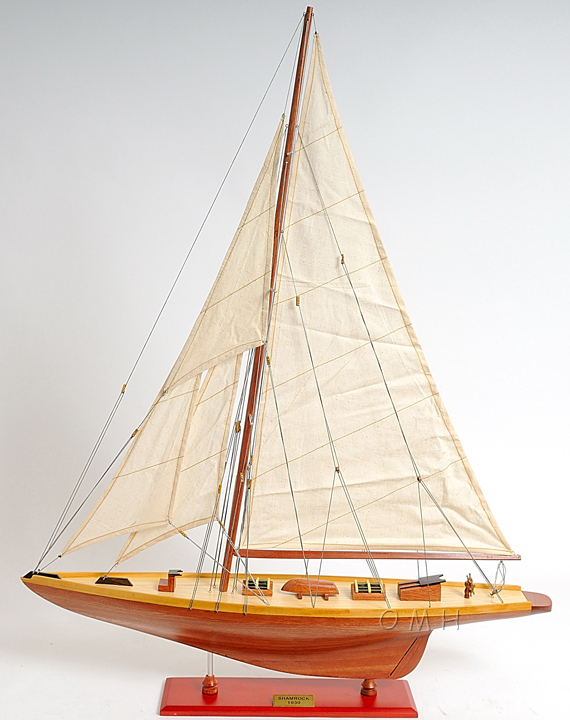 Product Dimensions (L x W x H): 32" x 6" x 38"
The Shamrock V is the J Class classic sailing yacht that is entirely built from wood in 1930s. Own a piece of yachting history and have it displayed beautifully as a home or office decor. Master craftsmen handcraft these highly detailed wood models from scratch using historical photographs, drawings and original plan. They are built to scale with high-grade wood such as: western red cedar, rosewood, and mahogany. They are 100% hand built individually using plank-on-frame construction method and are similar to the building of actual ships. Each model requires hundreds of hours to finish and must go through a demanding quality control process before leaving the workshop. The sails are hand stitched and rigged intricately from the masthead to the wooden deck, which is made of wood planks that are carefully pieced symmetrically for a beautiful finish. One can locate the wooden cabin and companionway around the middle of the deck. The metal steering wheel can be seen right above the rudder. Between the cabins is a miniature handmade wooden lifeboat. The stitched sail and intricate rigging complete the definition of a true sailing boat. The model is secured tightly on a solid wood base with a brass nameplate. The mast and sails are folded down for easy shipping. Itll make a perfect gift for home or office decorator, boat enthusiast, or passionate collector. Shamrock was a racing yacht built in 1898 that was the unsuccessful Irish challenger for the 10th Americas Cup in 1899 against the United States defender, Columbia. Shamrock was designed by third-generation Scottish boatbuilder, William Fife III, and built in 1898 by J. Thorneycroft & Co., at Church Wharf, Chiswick, for owner Sir Thomas Lipton of the Royal Ulster Yacht Club. She was skippered by Captain Archibald"Archie" Hogarth. She sailed to New York for the Americas Cup race in the summer of 1899. The Cup defender Columbia beat Shamrock in all three races. She returned to Britain in the autumn of 1899 and was subsequently refitted by Lipton and used as a"trial horse" to test the later challengers, Shamrock II, Shamrock III, and Shamrock IV.